Before you can begin selling tickets, you must connect Sparxo to Stripe. Sparxo uses Stripe to process payments because of its security, convenience, seamless integration. Learn more about Stripe at https://stripe.com. Legal Name The legal name of your business. EIN / Tax ID This is optional if you are creating an account as an individual. It is required if you are signing up for a Corporation, Partnership, Non-profit, or LLC. Business Address The address your business is registered to. Website Your company website address. Legal Name Your legal name, whether you are representing yourself or a company. Date of Birth Your date of birth, whether you are representing yourself or a company. Last 4 Digits of SSN To verify your identity, Stripe will ask for the last four digits of your social security number. Bank Routing Number Your bank’s routing number. Bank Account Number Your bank account must be a checking account. This is where the money from each ticket purchase will be sent. Email Address This email address will be used to log into the Stripe account. NOTE: It’s a good idea to collect this information before you register for a Stripe account. To connect Stripe to Sparxo, you can follow the Welcome Guide when you first create an account. On the third page of the Welcome Guide, click: “Connect a Stripe Account.” This will take you to the Stripe sign-up process. 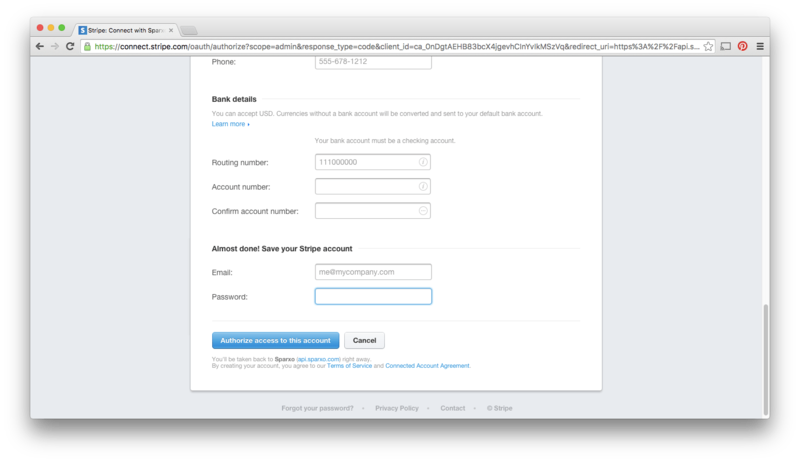 If you already have a Stripe account, sign in by clicking sign in near the top right corner of the page. If you don’t have a Stripe account, you will need to create one. It’s important to remember to select the currency that you are processing payments in. The bank account that is connected to your Stripe account must operate in the same currency, otherwise, there could be additional currency conversion fees.